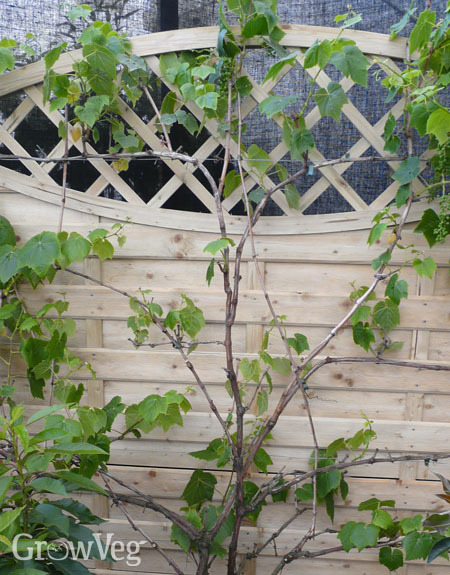 Fruit trees trained to hug walls or fences are a great place to start. Apples, peaches and pears may be grown as fans (where the branches radiate out from a central trunk), as espaliers with parallel branches, or single-stemmed cordons, which enables you to grow lots of different varieties in a smaller area. Walls that face the midday and afternoon sun will help to ripen fruits to perfection. Prioritise the sunniest surfaces for warmth-lovers such as figs. Many of these fruits can be found in our Garden Planner. Simply select ‘Fruit and Nuts’ from the selection bar drop-down menu then scroll through the selection bar to find what you’re after. When you add the plant to your plan, the grey-coloured area surrounding it shows you the space it needs so you can see exactly how many plants you can fit in without overcrowding. For more unusual fruits, select one of the generic fruit types – bush or trellised – then double click on it to bring up the Varieties box. You can then select a variety from the drop down list, or create your own variety, customising its spacing if required.